Hey guys! 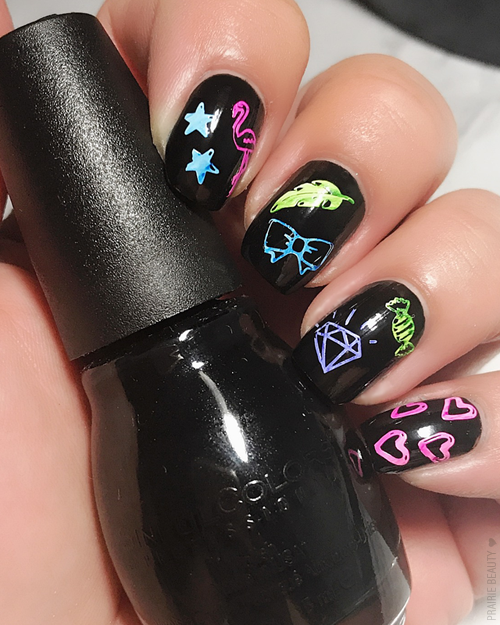 For this week's #CBBxManiMonday, the theme was Childhood inspired and I knew exactly what I wanted to do... Unfortunately I didn't have a ton of time. 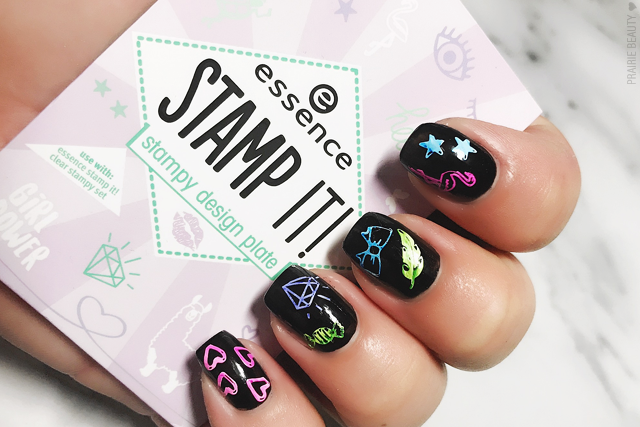 Still, I grabbed the new Essence Stamp It stamping plate and stamper - available locally at the drugstore and perfect for this theme! - and gave it a go! 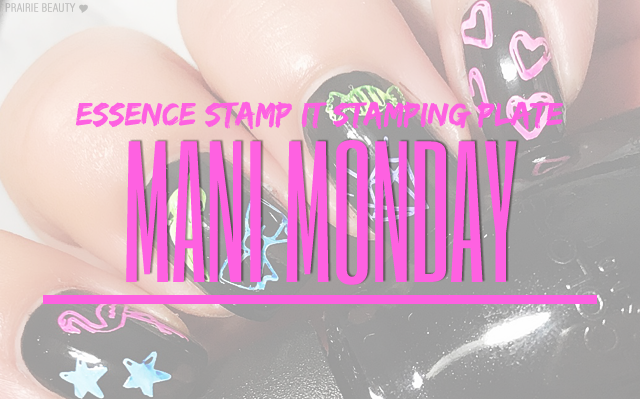 I wanted to feature the mani I put together as well as a review of these stamping products, so today it's a twofer! For this mani, I decided to try something that I thought might look a little bit like chalk drawings by pairing a black base polish with a sharpie stamping technique that pairs multi-coloured permanent markers with white stamping polish to get these bright, slightly milky images and I really love the technique. I chose several of the small images and filled them in using pink, purple, blue, green and red sharpies and then applied white stamping polish to transfer the stamp. As you can see, the images didn't really turn out uniform, but I actually really like the way the white sort of wove in to create a textured look to the images. It's not necessarily as perfectly crisp as I would prefer - all my fault, I was definitely a little bit rushed as I put this together - but I think it's a pretty cute mani and I'd actually really like to apply it to my neices' nails because I think they'd go crazy for it. As you can see the Essence Stamp It! 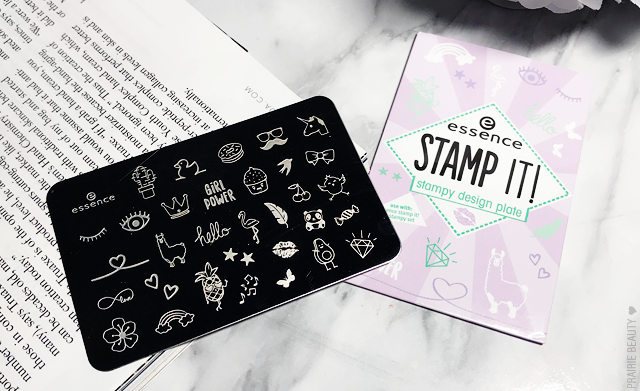 Stampy Design Plate in 01 Nails Just Wanna Have Fun is filled with small, cute images that really would work for a young person's nails. For me, it's getnerally a little bit young, but I do like having this plate on hand because some of the images will definitely come in handy. Overall, I think most of the images pick up and transfer really well, with crisp lines and good fill, but there were a couple of images that I just could not get to transfer well - I'm looking at you Sassy Pineapple. There's also a lot of great images for reverse stamping that could create a really adorable mani. That's really how I would describe this plate - Adorable! For someone who might just be dipping their toes into stamping, I feel like this could be a good choice. That being said, there is a second plate that Essence created in this line called Shapes Of Glory that contains more geometric designs that I think I would like even more, but I'm pretty sure it's only available in Europe thus far. Crossing fingers that it crosses the pond! The most exciting thing about this release for me was that Essence finally released a solid stamper that's available locally at the drugstore. 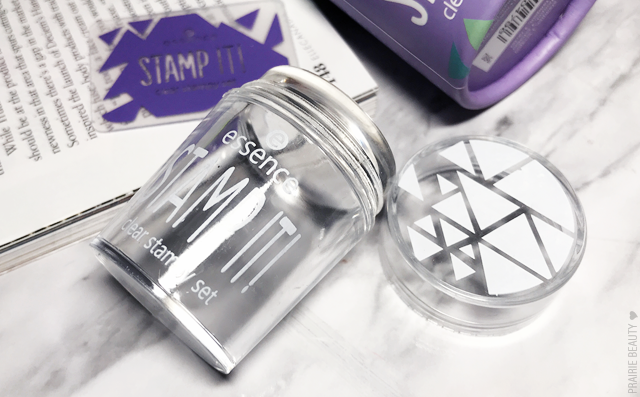 The Essence Stamp It Clear Stampy Set contains a clear stamper that's quite squishy and a little bit sticky as well as a really small, firm scraper. I've actually used this stamper in quite a few mani's recently and I've really enjoyed how it picks up and transfers, so I wouldn't hesitate to recommend this as something to try. I do find, though, that sometimes what kind of stamper a person likes is a matter of taste, so this might not be for everyone. Also, even though it is clear, I do find that I get a little bit of magnification and distortion when looking through this stamper because the plastic is so thick. I really wish that they had made the bottom of the stamper removable so that I could get a clearer image and more precise placement. But like I said, I still really enjoy this stamper. So there you go! A two for one Mani Monday. I'm genuinely really excited that Essence released their Stamp It! products locally here in Canada, because stamping products have just not been available in stores here and it can be a pain to order stamping products online when you're just starting out and want them to come quickly. I think that this stamper is genuinely really good and I will almost certainly end up buying another one. With the plate, I do think it's definitely suited to a younger person - hence the inclusion here in the Childhood theme - but it's also a good one to practice on and play with for more whimsical nail art. Don't forget to head over to Cosmetic Proof, See The World In PINK, and Tea & Nail Polish for more Childhood inspired nail art looks for this week's CBBxManiMonday!